In a new global era, one in which international conflicts and problems have ongoing repercussions at home and around the world, the challenges can seem impossible for individuals to overcome. Peace in the Middle East? Defusing age-old ethnic hatreds and hostilities? We want to change the world, but what can we actually do about these enormous problems? Christians and faith-based nongovernmental organizations have much to bring to the table, says Robert A. Seiple, former U.S. Ambassador-at-Large for International Religious Freedom. With a distinctively Christian vision for global engagement, peace and reconciliation you can make a significant difference in even the world's most intractable conflicts. Filled with compelling stories and on-the-ground reports from Rwanda, Bosnia, Sudan, Lebanon and other hotspots, Seiple's book demonstrates how you can be an agent of change and ambassador of hope to the most challenging regions of the world. In this long-awaited treasure of wisdom and inspiration acquired over a lifetime of service around the world, Ambassador Seiple raises the bar for thoughtful and effective Christian engagement with the toughest challenges of the new millennium. 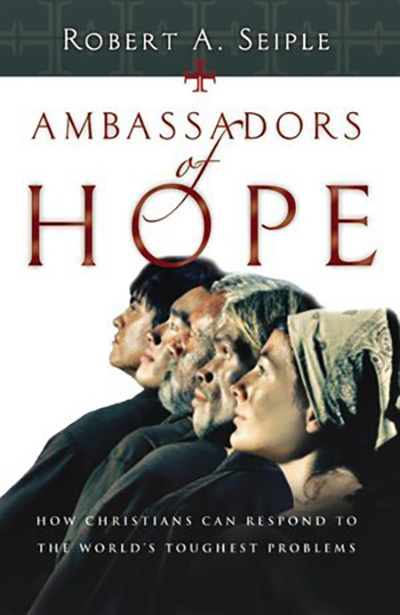 No Christian leader seeking real-world solutions for a hurting globe should be without the counsel of Ambassadors of Hope.